Danny Duzit Scrubber, Handy Helpers: Southern Flavoring Company, Inc. This is no ordinary scrubber! Danny Duzit scrubs hard, but won't scratch your pots and pans. High-grade stainless-steel lasts a long time, so you can use it over and over without worrying about it rusting. My Mom, Grandma, Aunts and everyone we knew would order these scrubbers, along with a yummy variety of flavorings from the church home extension club. 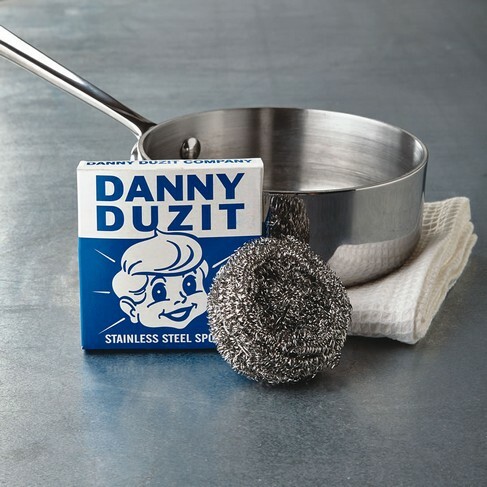 Danny Duzits are truly heavy duty and nothing like the cheap metal scrubbers in stores today. They will clean your cast iron skillets like nobody's business and will last eons longer. The flavorings made the best tea cakes ever! Love these products and hope they are around for years to come. U Have been using these for about 10 years .Always keep a supply.